During the workweek, my company has a “dress for the day” policy. Our intern Riley, aka The Riles, does a stellar job complying. Take The Riles out of the office and put him at Lambeau Field in November for a 3:15 pm kickoff and he could use some improvement. The Riles and his friend Coop, aka Cooper, rolled into Lambeau in hoodies and sweatpants, one cheesehead and a pair of gloves between the two. It’s a good thing too that he got to know the ladies behind him because in the second half when the sun went down, it got colder. It was only then that the ladies offered their stadium blankets. I’m still chuckling as I picture The Riles and Coop getting ‘tucked in’ by a group of ladies estimated at between 60-70 years of age in the stadium. For the record, the phrase ‘tucked in’ came directly from The Riles, not me, and I told him I was going to write about it. Hunters in Wisconsin will be well prepared to start the unofficial holiday weekend known throughout the State as the gun deer hunting opener with Thursday night football. Required to wear at least 50% blaze orange starting Saturday in the woods, they’ll be setting their clothes out early and are probably taking a vacation day Friday. 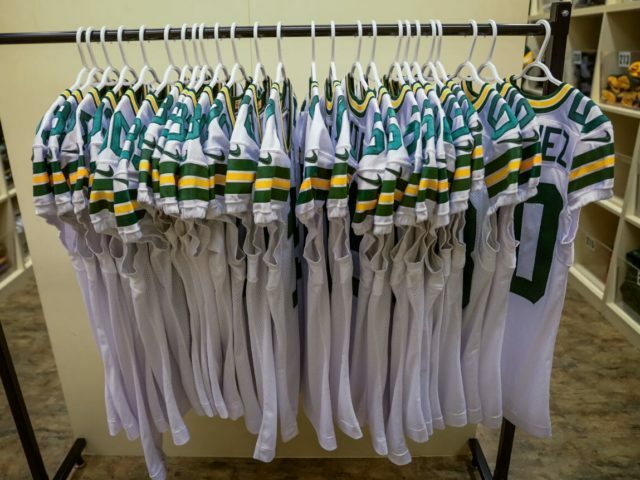 No longer forced to, the Packers have chosen to dress for the “Color Rush” day on Thursday. While I dislike the all-white uniform, I dislike the Seahawks even more. Forecast for kickoff says low fifties and partly cloudy so take one out of The Riles’ playbook and wear a hoodie if you’re going. A 13x World Champion vibe always, did everyone see the Packers’ recent post about their head seamstress Marge Switzer and her team? The NFL also did a Films Short titled the Seamstress in January of 2012. Based on my math, Marge, a third generate seamstress has been with the Packers in her role for 22 years. A wise pin on Pinterest once said: the clothes make the man. This entry was posted in Packers 2018-2019 Season, Sarah Szejn, Uncategorized. Bookmark the permalink. When the Pack comes out on the field in the white they look invincible! Pure power. I love them.